In the kind of weaving that I like to do on my backstrap loom, that is, warp faced weaving with pick up patterns, the poor old weft thread rarely makes an appearance. When it does, it usually means that something has gone wrong…a warp did not get raised in one of the sheds thus exposing the weft in its place, the warps haven’t been well spaced to completely cover the weft or the selvedges have been poorly woven. I even use weft colors that match the edge of the fabric so that the tiny turns of weft at the edge blend in with the warp color and are, therefore, less visible. This week I have been playing with a technique that gives one weft at least, the starring role…the supplementary weft. (See the tutorial on this technique here). In some backstrap weaving cultures, everything is about brocade which is created with supplementary wefts, and it is the warp threads that take a back seat. This all started when I uncovered a project lurking in the closet. I wove this supplementary weft piece as an attempt to reproduce a design on an old textile fragment that I have – the only one which has a design in a supplementary weft. I took this loom to show at CNCH last April so it has been hanging about here untouched for some time. Not feeling inclined to continue with this design as the exercise had served its purpose, I decided to use the rest of the warp to sample other traditional designs which I had been saving in a folder. 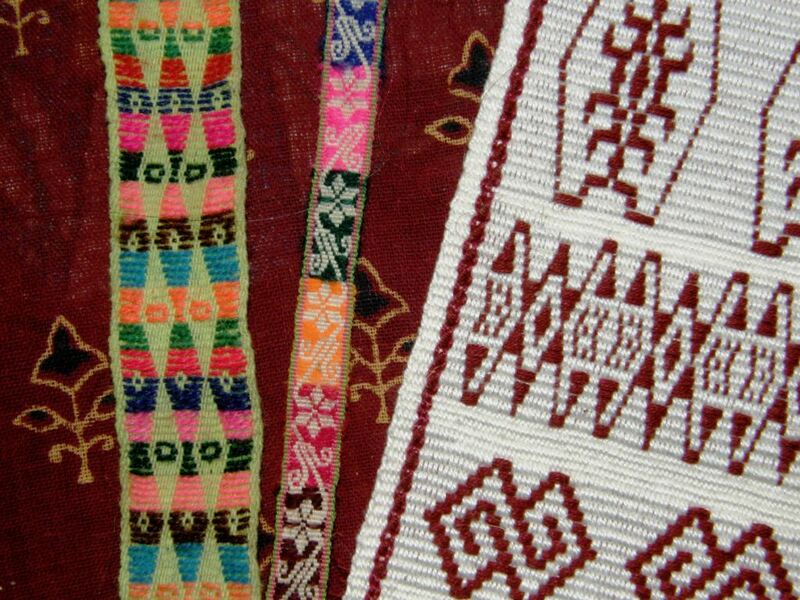 On the left, Chris Buckley had sent me this image of a blanket made by a Li weaver of Hainan Island. Montagnard weaver Ju Nie made this Rhade head band with many small motifs woven with supplementary wefts. These are some of the many gorgeous Indonesian pieces that I admired at the Dancing Threads stand at Convergence last year. Ladies wearing hats decorated with weft patterned hat bands can sometimes be seen in the streets here and I have managed to purchase a few of the bands in my travels in the highlands. 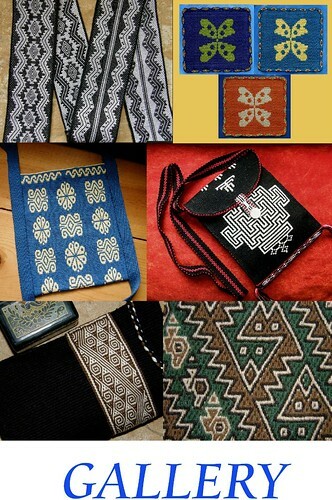 I will never forget the beautiful Guatemalan textiles and the weft patterning techniques I learned with my teachers there. I even uncovered these cotton Indian pillow covers that my aunt had brought back from Chennai. I had had to put them away as my cat was chewing the twisted ends of the weft twined sections. Here supplementary weft patterns have been combined with small sections of weft twining. The little warp float section is interesting too as very thick and thin warps have been combined, the thick black warp pushing aside the white to expose the white weft. 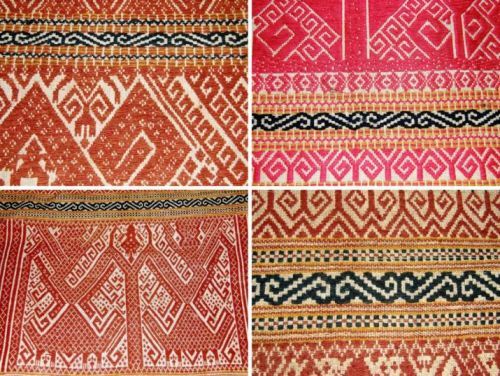 On my last visit with Betsy Renfrew and the Montagnard weavers I got to see these Bunong weft patterned textiles for the first time. Of course, Karen Elwell’s fabulous Flickr page of Mexican textiles will always inspire me. 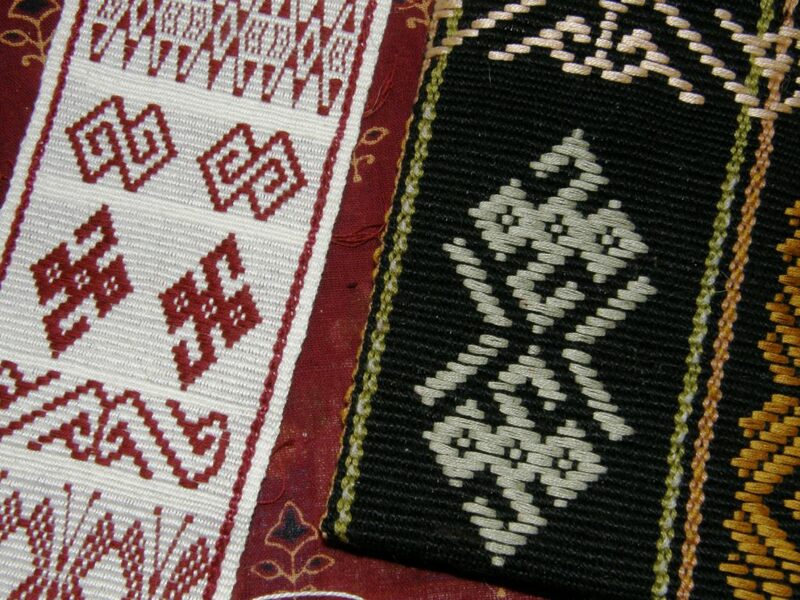 Someone pointed out to me the other day some Huave pieces with their little suppementary weft figures woven in what appears to be natural white and brown cotton – quite a contrast to the bright and lively colors in most of the pieces above. So I took a bit of this and that and wove some samples. The stripes that I had included in the warp kind of got in the way. First I took an Indonesian motif and tried to weave it in behind the stripes and decided I didn’t like that. Then I put it on top of the stripes…nope, I didn’t care for that either. It was time to move on to a new warp. The designs in between are taken from the Li blanket with some changes of my own. The ground warp is a 24 wpi crochet cotton with two different kinds of thread for the supplementary wefts. 24 wpi ground warp and weft patterned with doubled strands of embroidery floss. 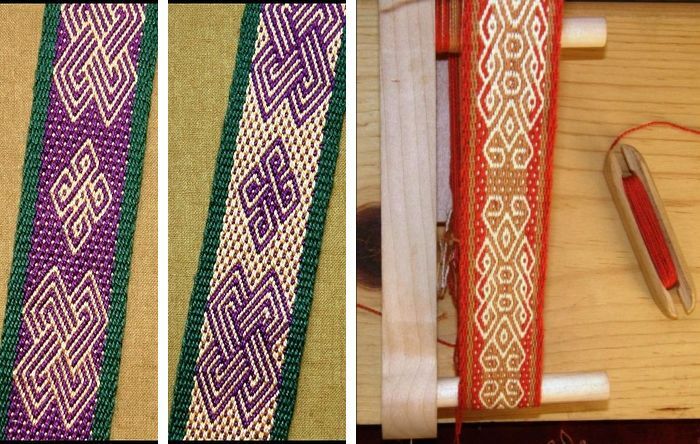 For the textile fragment reproduction I used 6 strands of cotton patterning thread that I bought in Guatemala (center picture). The thread is sold in skeins of single strands. 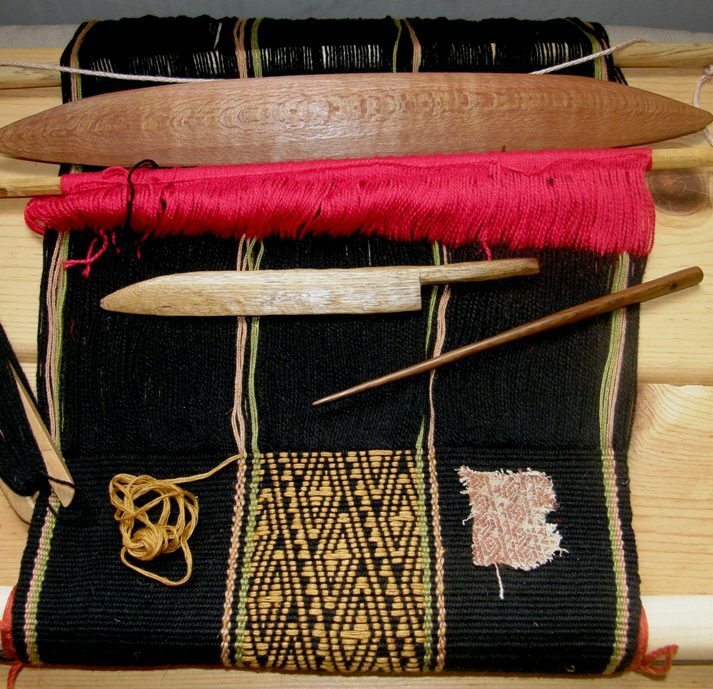 It is easy putting the six threads together and they work well as they lie flat on the surface of the weaving. 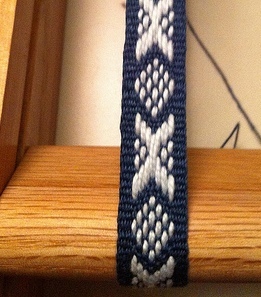 I used doubled lengths of the embroidery floss (pictured on the right) for the first band of pattern above that. This works well but, as the lengths are ever so slightly twisted, the two pieces tend to separate in the longer floats. If I had no other option, I would pull out each of the individual strands and put them back together again without the twist. One day my Guatemalan thread will run out and I am thinking that the tatting thread pictured above left might do the trick. My friend Sharon in the US sent me an enormous bag of tatting thread recently and it is very similar in size to the Guatemalan stuff although stiffer. The black warp got cut off the loom and will be a sample piece. I gathered up all the designs I wanted to weave and made a new warp, this time with 35 wpi crochet cotton as the ground warp and weft. I collected Huave butterflies, Indonesian borders, Central Asian supplementary warp motifs which I adapted to supplementary weft, patterns from Montagnard and Li textiles, Guatemalan birds, brocade designs from Lithuanian sashes as well as one of my own inventions. 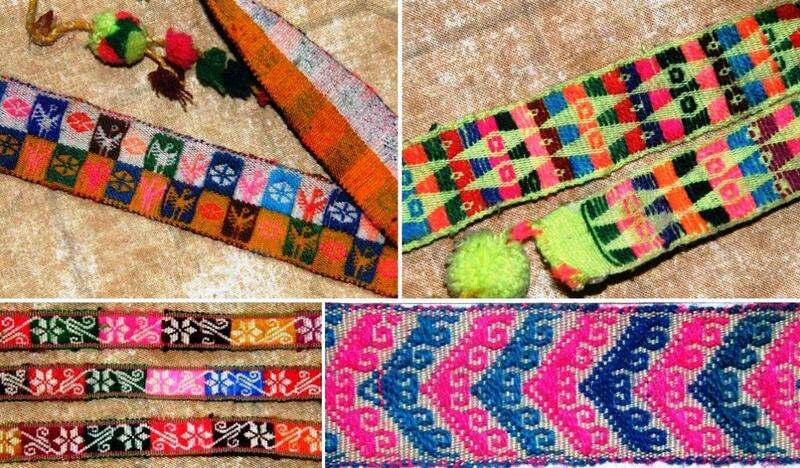 I still have some Mexican and Miao motifs to play with and am looking about for more ideas from other cultures. 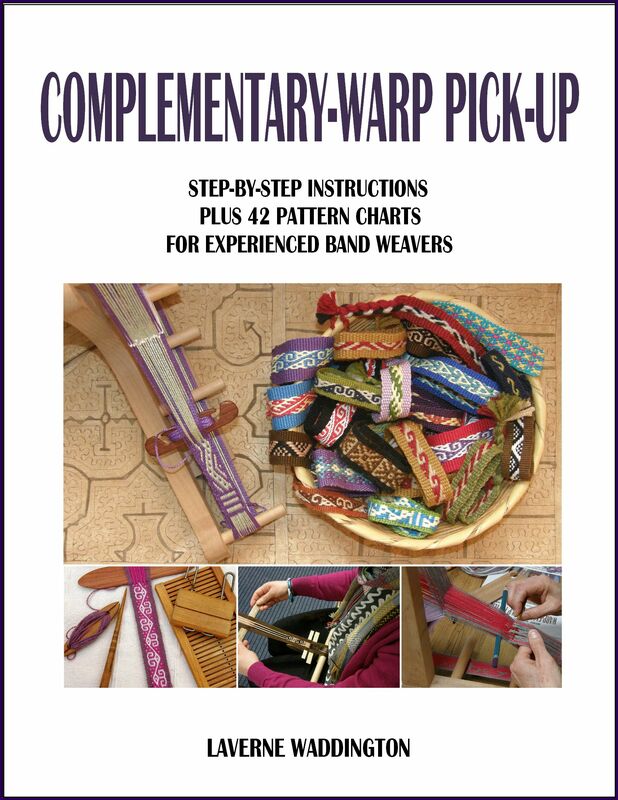 One thing that I wasn’t quite so aware of was the different kinds of supplementary weft patterning techniques and the ways in which they are classified. I have always wondered about the precise definitions of brocade, inlay and supplementary weft patterning and if, in fact, all three terms refer to the same thing. Brocading uses extra yarns – supplementary weft yarns – to ornament a ground fabric, with floats on at least one face…….If we want to be fancy, we can call brocading, “extra weft patterning”. But the simple word brocading is adequate. She then decribes different kinds of brocading: overlay-underlay, underlay, overlay, reciprocal and inlaid, the latter being the kind that I am playing with here. She also notes that in oriental textiles inlaid brocade yarns and knotting often share the same pattern row which makes my head spin with new possibilites! With this 35 wpi ground warp I used six strands of the Guatemalan thread. Once I have finished all my planned designs, I will start experimenting with the tatting thread. What I like about this kind of patterning is that your warp is basically a blank canvas on which you are free to change colors and place designs as you please. 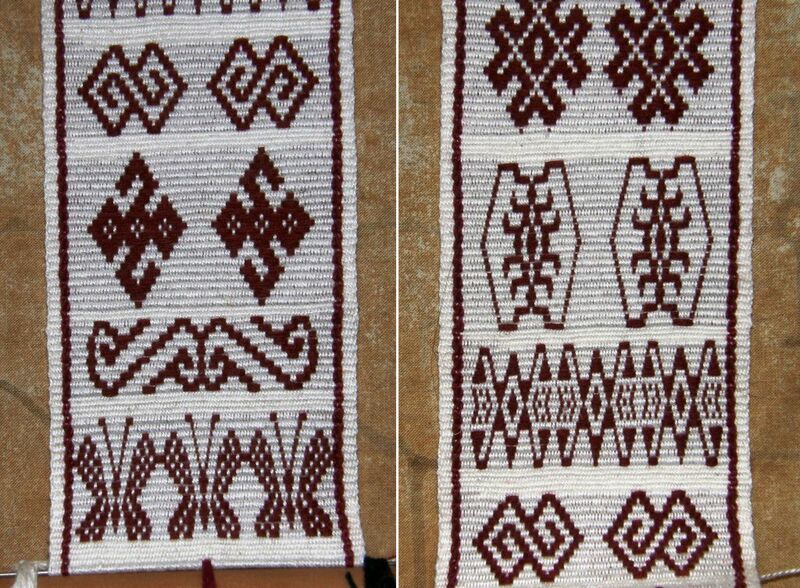 Here are a couple of examples of warps that I prepared for warp float patterning to which I decided to add supplementary weft motifs pretty much as an afterthought. On the piece on the right I used one and half strands of embroidery floss. On the piece on the left I used single strands of the ground weft which left gaps and gave the design the same striped effect as the outer columns of warp float designs. A couple of other brocaded pieces that I wove using the Guatemalan thread on the left and embroidery floss on the right. 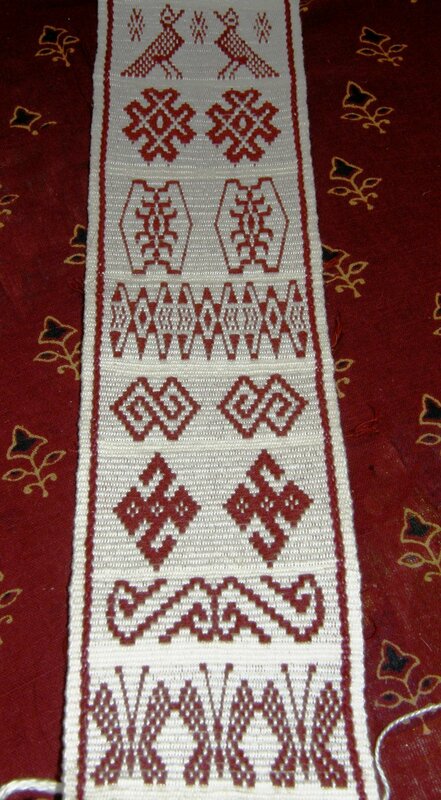 The piece on the right combines the inlay technique with wrapping to create the long horizontal and fine vertical lines that would not be practical using the inlay method. Here is a view of the two samplers showing the difference in the weight of the threads I used. Why didn’t I do any of the Bolivian hat band designs, you ask? Those have been done in super fine thread which allows them to have very long floats in their supplementary weft. You simply would not get away with such long floats in heavier thread as they would be long, cumbersome and unsightly. You can be sure that another warp in sewing thread will be coming soon so that I can indeed do these designs. I am also looking forward to doing designs where the supplementary weft actually fills in the negative rather than the positive spaces. Here you can compare the size of the hat band thread with my 35 wpi thread. And don’t get me started on the mind boggling fineness and complexity of the brocades from Laos!! From supplementary wefts to supplementary warps….you may recall from last week’s post that I wove my first Sami pattern band in a supplementary warp technique. I want to explore and use this technique more as a supplementary warp patterned sash will be part of my big “sash project”. This is actually one of the techniques where you could allow the weft to play a role if you chose to. In the examples at left you can see the little orange weft spots showing through as orange weft has been used to match the edges. If yellow weft had been used the background would appear to be a solid color. My weaving teacher liked the decorative effect of the weft spots. 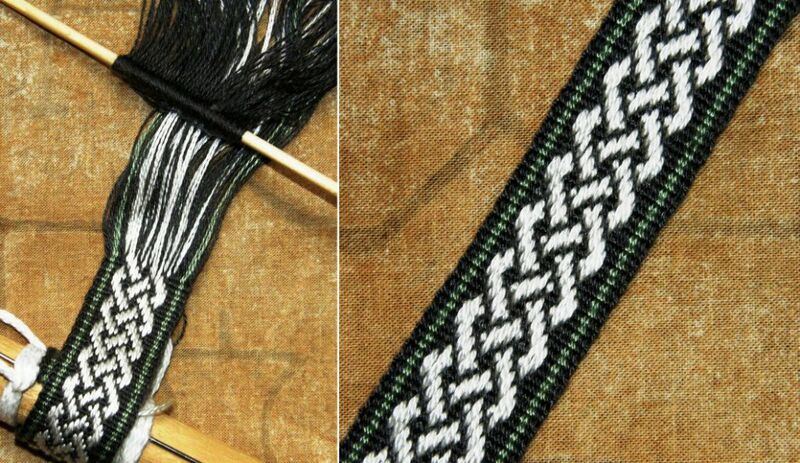 The band on the right appears to have a solid background of white as white weft has been used. You can just see the white weft turns on the edge. For my next supplementary warp experiment I used the handout that we had been given in Robin Spady’s inkle weaving presentation at CNCH last year. Included is a pattern for a Celtic knot. This experiment served two purposes as I also wanted to try out some tencel that I had received in a swap with a weaving friend in Denmark last year. I really wanted to see how the colors would look together…a light green and a gray-ish purple along with an off-white that I bought at the Mannings. I have never used tencel before and was looking forward to see how it looked and felt when woven. 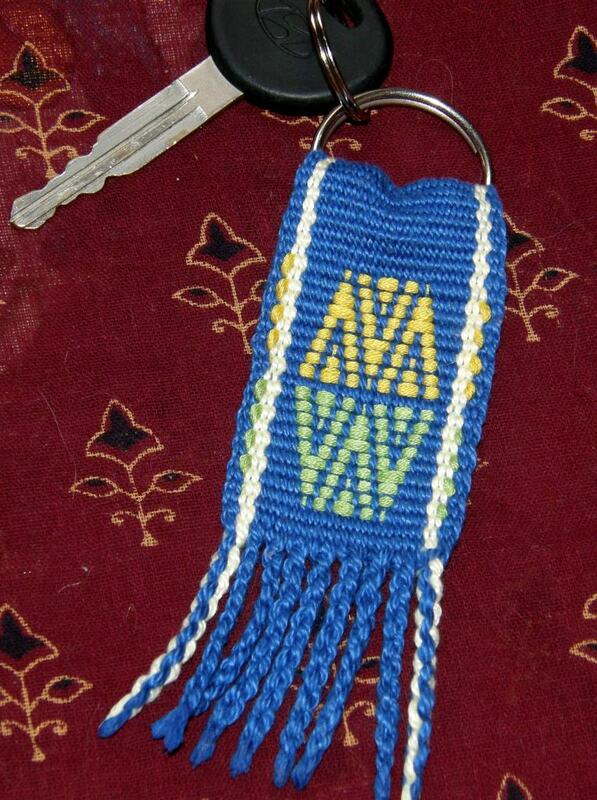 I made this on my backstrap loom. Just as everyone says, it has a lovely sheen and is very sleak. The weft did want to wiggle out a little and I found I had to put it back in place each time I changed sheds but I love everything about this…the colors, the pattern, the texture and the sheen! This is a thirteen-pattern-thread design which Robyn calls “my all-time favorite pick-up pattern”. Karen Madigan gives the pattern for a twelve-thread Celtic knot (which she says is based on a design from Sara Lamb) on her Curious Weaver blog. By the way, I know a lot of people have Sara Lamb’s Woven Treasures book. Sara teaches this supplementary warp technique right there in her book… just in case you missed it. Take a look at a different version (the pink one) on Annie MacHale’s blog here. I couldn’t resist tipping this Celtic knot pattern sideways and trying it in a supplementary weft. I know that I can improve on this if I decrease the spacing and have the edges curling over more. That’s something to work on further this week. 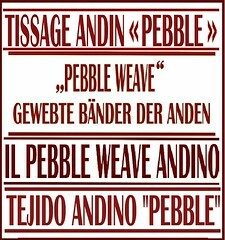 The designs above and below were taken mostly from tablet-woven bands and I wove them using the Andean pebble weave technique that I teach in my book. Jennifer from the Weave Along group made her first Sami band on her inkle loom this week (at left) as well as Tanyabe who says that she actually has a drop or two of Sami blood in her. Hopefully we shall see her pictures soon. The Weave-Along has become rather quiet. I suspect that folks are working on their “secret” project for the grand finale. I also like to think that the Weave-Along has helped create confident independent weavers who are trouble shooting, experimenting and problem solving on their own….let’s see! And the loom bag project continues. This loom bag will weigh a ton by the time I have all the bits in place! This piece of fabric with its pebble weave design will be used to make the three zippered pockets on the back of the bag for holding belt shuttles, elastic bands, scissors, tapestry needles and all that stuff. 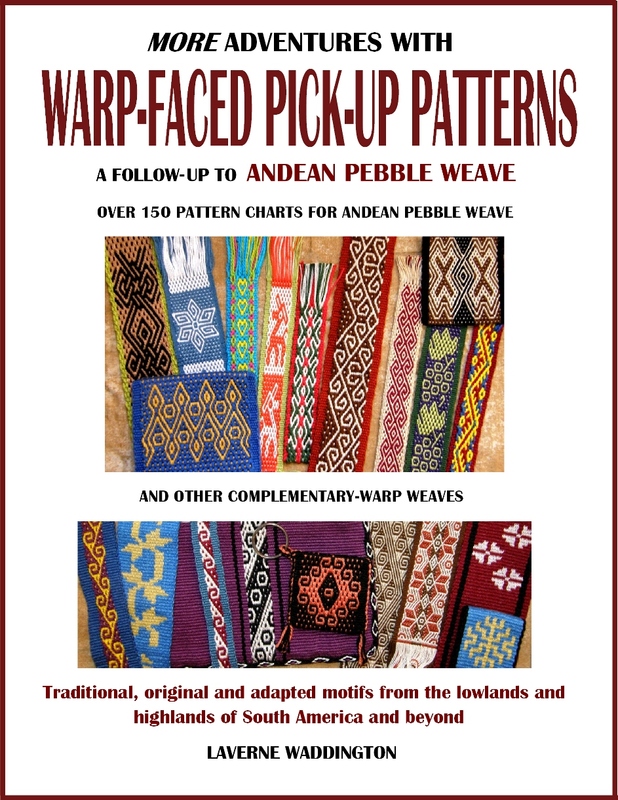 Thanks for the references re the Andean braids in Weaver’s Journal. (Actually, we all have Jennifer to thank for these references).I didn’t know they were all available on line. I have some but was happy to find the others. 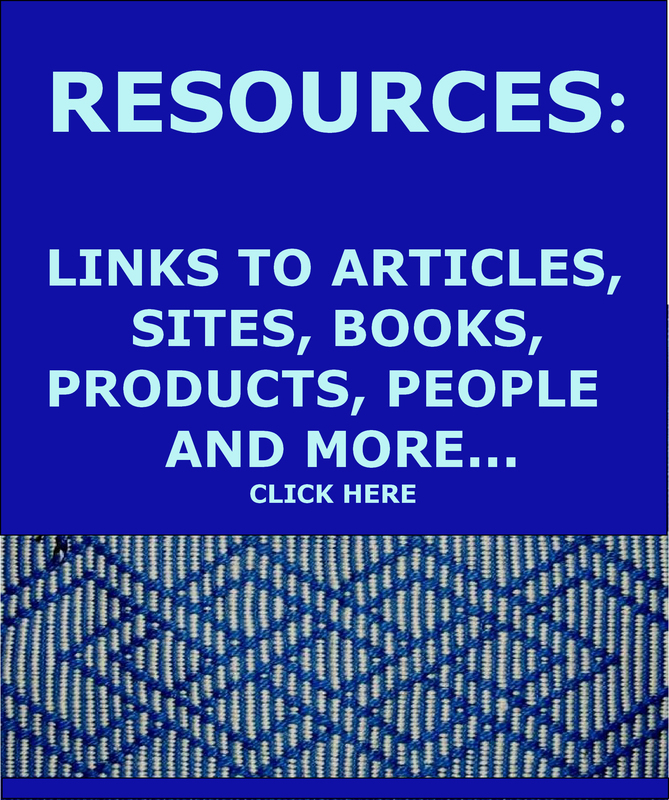 There are quite a number of other interesting articles that might also be of interest to you or other members of the backstrap weaving groups. Issue 4 – A Tubular Edge Braiding from Bolivia by Adele Cahlander and Marjorie Cason. The downloading takes too too long for me but considering the topic of this week’s post, I think I must look at issue # 24! Que hermosos trabajos!! !, me enamoran los diseños, estan geniales, enhorabuena, muchas felicidades. I have often thought that supplementary weft might be the answer to my solid background dilemma. Almost like tapestry, you can change colors whenever you like and ‘paint’ a picture. My double weave piece is coming along very slow as it is in #10, BUT at least this time I can see it well enough to work on it. It is a 10 ft. long warp, 70 warps wide, so this one will be on there for a while. I would love to see you in action if you ever make it to central Illinois. I follow your work and admire your active and tireless sampling and research. You are truly a 21stC handweaver with the spirit of thousands of handweavers over time who are willing to learn and to share. I have been weaving since 1966 and have not been this inspired for a very long time. I have not dropped everything else I am working on to dive into your pool of learning experiences but I have your book and am saving all of the information that you send to me. I do understand what I read and I am fascinated by your pursuits. Please keep the whole world as your close friends. Laverne, I am once again in awe of your ability to replicate pattens and techniques. I was never successful with my attempts at brocade on the inkle, but will try again one day. Thanks so much for linking to my blog. The pink and purple Celtic knot piece really did turn out nicely, although it is a bit bright! The wealth of your weaving is growing so rapidly and amazingly beautiful. Yonat.